After impacting 4,000 youths, 500 children and about 100 women, Agrasar, one of the nimble NGOs that has braved many odds, continues to make a valuable impact on the society. And not only by redirecting the resources towards the disadvantaged community, but also by using intelligent processes, wo/man-power and technological vision. They run 4 skill development centres, 3 learning centres in Gurgaon as of October 2017 and it’s growing. The path hasn’t been easy; Prerit, CEO of Agrasar believes that it is hard, if not impossible, for NGOs to build a partnership of trust with the corporate and society. There is a scope for betterment with more attention towards NGOs and their work. At the same time, he takes ownership and believes that building trust is a responsibility of NGO and its leaders. The great leaders cannot simply ask people to trust them, they need to demonstrate their intentions and their passion, they need to give proof. And often, proof can be assembled and shared by using some guiding tools. One of the tools Prerit believes it can be done through is technology, along with the right people. He has strived hard to incorporate tech in his organisation. His team is motivated and charged-up to reduce waste and eliminate hassles from day to day operations of running their NGO. A mission driven outlook of the organisation. Read on for the complete story. Agrasar met with ColoredCow during one of the projects which gave way for “can you redo our website” kind of discussion. Since we were getting closer to the social development sector at the time and finding more ways to help them amplify their impact, we were excited about the proposition. Also, we didn’t know at the time that together, we’d take a remarkable journey of building a digitised NGO. And hence, Agrasar’s vision of building trust, transparency and hygienic work output, by including tech was divided into two parts, the website and the software platform. Working with them was a delight. It’s true that you put out your best foot forward when you work with a passionate and driven team. The goal was to give the organisation a new face and a representation that their growing organisation needed. They wanted to transform the way their NGO reached their audience including their team. And also to keep their ongoing evolution reflecting on the website. Having grown in number, strength and a lot of other ways, Agrasar passed on their vision and founding principles to us. We sat down for an initiation into Agrasar, in getting to really know them and started off on a high note of transferring the vision behind the project. We used this to build the new concept. 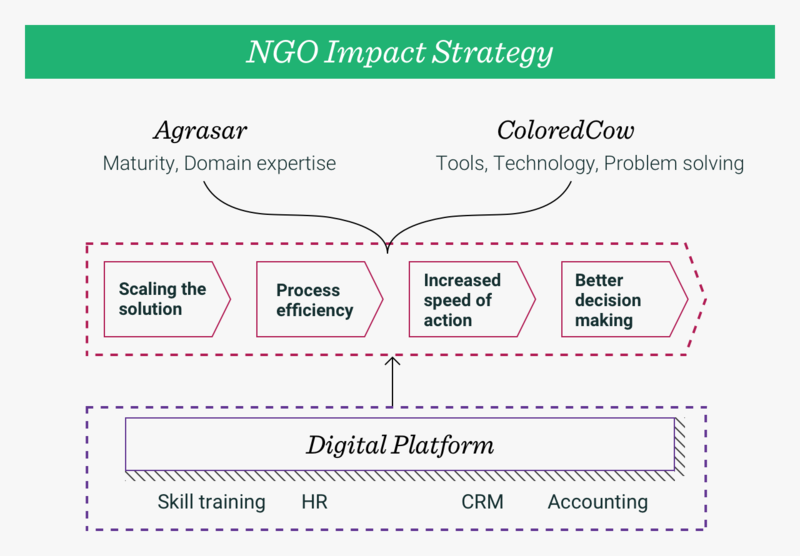 Besides these fundamental pillars(which may be common to all NGOs) there were other things that Agrasar wanted to accomplish through the website. They have identified being people-centric and honest as one of the most important values that drives them. We made sure that the website reflected that. The new website incorporates the team member’s opinions and feelings about working in different areas. So when someone reads about Agrasar on their website, they also get to know the team members and their thoughts for the human touch. Agrasar also has a true philosophy for the impact they make, and to reflect their honest value, we added this philosophy along with the showcase of their impact. 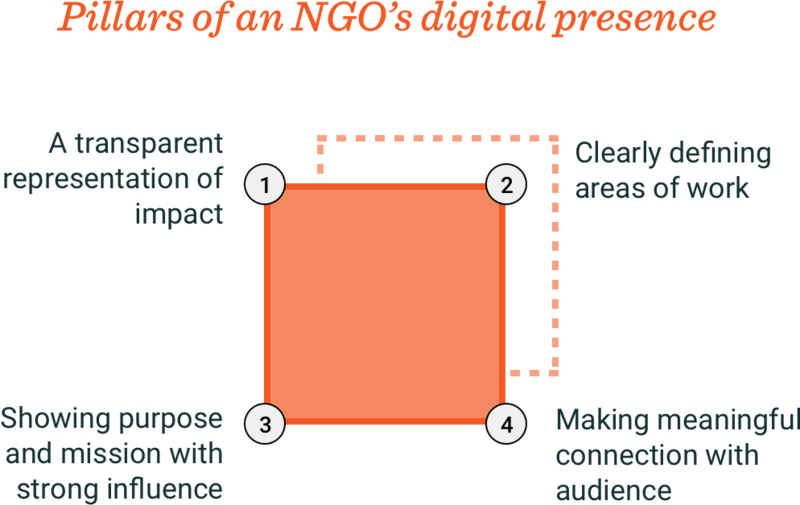 Through an amalgam of these objective pillars, an NGO in general, can transfer their purposefulness to their audience. This is what we worked on for Agrasar. Here are some of the organizations who do that, ex. : , Charity::Water, Watsi. .
As a result, the new website gives a comprehensive and trustworthy image to the collaborating organizations and other stakeholders. It motivates their team to be a part of the organisation and to take pride in it. Together with Agrasar, we saw the possibilities of introducing technology into the functioning/operations work. They had been conceptualising methods to enhance the hygiene factor of their work and processes. They believed that automating the tasks that can be done better with support from technology will be a solution. We perfectly aligned with their thought. Technology is truly transforming the social development sector. And Agrasar for having such a vision sets a prime example of that. And to the credit of their values and tech vision, we were able to partner with them to build a tech-enabled NGO that uses a digital platform for various functions. The digital savviness of Prerit and his team was instrumental in taking this path. The partnership was mutually realised as we were solving problems each in our own way of expertise. Agrasar by being involved with the community and we, by backing them with the right technological support. The success of this endeavour has been strengthened through a digital roadmap and by identifying new opportunities and challenging the traditional ways of thinking about creating impact. Securing server with access control and environment segregation.